December 25 is an exciting day around the world. But 24 hours goes by pretty quickly! In order to extend the excitement many countries, including Australia, begin to create a Christmas feel several weeks before Christmas Day. 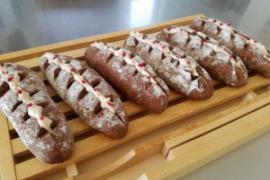 In English, we call this “getting into the Christmas spirit.” It can be done by baking Christmas treats, reading traditional Christmas stories with family, listening to Christmas music, putting up the Christmas tree, and decorating houses inside and outside. Sometimes, entire cities will “get into the Christmas spirit” and adorn government buildings, schools, churches, and entire neighbourhoods in lights. 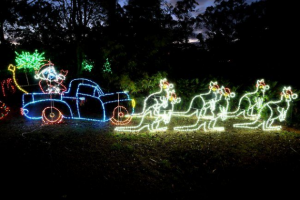 In Australia during Christmas season, families and friends like to drive around in the evening to look at these displays of lights. They can be very impressive! As you might expect, many Christmas lights displays are in the shape of Santa, snowmen, the nativity, reindeer, or snowflakes. But these may not feel quite right to Australians, who have Christmas during the hottest time of the year! So we make sure to include some crocodiles, kangaroos, or other very Australian things. 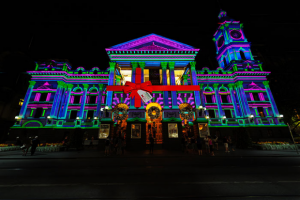 In my city of Melbourne, the town hall is decked out* in Christmas lights. Other cities decorate their most iconic buildings or areas too, as you can see in this picture of the Sydney opera house. 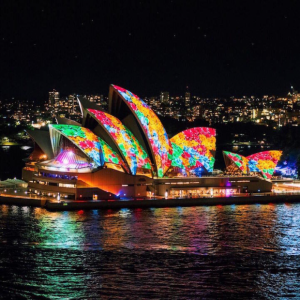 A recent problem Australians have encountered with Christmas illuminations is that they use a LOT of energy. As with other nations in the world, Australia is experiencing an energy crisis, and many families are trying to find ways to cut their energy usage. So what is a Christmas-loving family to do? Use solar panels, of course! Warm, sunny southern-hemisphere summers bring lots of light with them. Many families use solar panels instead of traditional electricity. But if you do not have solar panels installed at your house, not to worry. It’s pretty easy to buy solar-charged Christmas lights. Place them outside your house during the daytime, and they will be ready to use by night! **To be decked out = fully, impressively decorated.